It's always fun to see how trends wax and wane in video games. Almost every shooter that's come out in the past decade, for instance, has had to acknowledge the meteoric rise of Call of Duty and the fast-paced, twitchy sort of competitive gameplay it's popularized. Now, that influence seems to be slowly fading. Rainbow Six strikes me as interesting example of how other kinds of shooters (read: ones that aren't like Call of Duty) are trying to reassert themselves as of late. 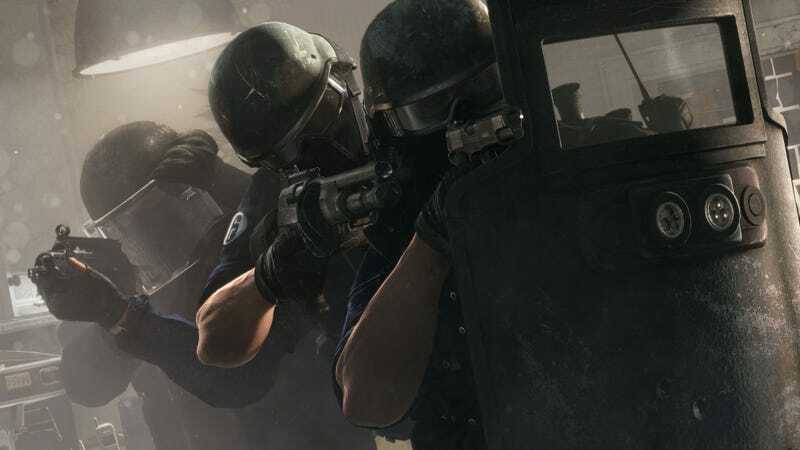 For much of its life, Rainbow Six was celebrated by gamers for the way it encouraged a methodical sort of tactically-minded gameplay. Writing in a post on the game's website today, two developers working on the the next big Rainbow Six game, Siege, explained how they're trying to resuscitate that by bringing something back from the very first game in the series: omitting respawns from its multiplayer gameplay. To the uninitiated, "respawning" is the process of coming back from the dead after you've been killed in multiplayer shooter. With the notable exception of Counter-Strike and select gameplay modes in Call of Duty and Battlefield installments, most modern shooters don't like to place limits on player's ability to respawn during a given match. And why would they? Being able to restart and try again after you die sure seems like something most gamers would prefer. When you're not allowed to respawn during a match, twitch reflexes aren't the only skills that keep you alive. Teamwork, map awareness, planning, adaptability, communication, and leadership become just as important to win. To be completely straightforward, the game became a lot more stressful… It went from everyone leaning back in their chairs trash-talking, to being on the edge of their seats carefully coordinating tactics. However, there's a reason why the No Respawn rule is something we've seen fade out of gaming in the past decade. In a traditional FPS setting without respawn, once the player is dead and out of action they don't have very much to do. As a player, you want to stay involved, and getting placed on the sidelines with nothing to do is not the ideal experience. The reason we consider One Life to be a different concept in this game is that you will be actively involved the whole time. Yes, losing boots on the ground creates a disadvantage in firepower, but the player still contributes to the team by becoming a source of information. They are able to use limited visibility tools, like the drone and security cameras, or survey from a chopper above the operation zone to keep their team informed of the enemy's movements. So rather than leave players to sit and twiddle their thumbs until the match is over, Siege will still let them participate in a match after they've died—albeit in "Support mode." Neat. I haven't played any of Rainbow Six Siege, so I don't have an educated opinion about how its multiplayer, or the "Support mode" specifically, will actually play out once it's in gamers' hands. But if nothing else, I like that the developers are taking a hard look at what did and didn't work about past Rainbow Six games, rather than letting nostalgia cloud their vision. The developers on the XCOM reboot certainly weren't shy about doing something similar when I spoke to them, and I think that's a big part of what made Enemy Unknown such a success. I'm as much of a lapsed Rainbow Six fan as I was an erstwhile XCOM player, so I hope Siege can do something similar.